YOUNGSTOWN, Ohio – Liz Petrie peeked into the window Tuesday morning of the new Bistro 1907. It wasn’t the first time, said Petrie, a budget analyst with Mahoning County. She and a coworker have been stopping by to check on the restaurant’s progress since work on it began. “We’re waiting. We cannot wait to have dinner there,” she said. Bistro 1907 is on the ground floor of the new DoubleTree by Hilton Youngstown Downtown, which opens its doors today. Petrie said her brother-in-law is staying at the DoubleTree next month for the John Fogerty concert at the Covelli Centre. The downtown hotel held a soft opening yesterday, with Hilton representatives involved with the project staying overnight. A media preview of the 125-guest-room property is scheduled for this morning, following a meeting of the Western Reserve Port Authority’s board of directors. Anthony Trevena, WRPA’s director of economic development and head of its Northeast Ohio Development and Finance Authority, was on site Tuesday to drop off materials ahead of today’s meeting. “This is an exciting day,” Trevena remarked. He is aware of guests who have already booked space at the hotel including individuals involved in various economic development opportunities and companies, he said. The port authority helped arrange the capital stack for the $32 million project, including $11.5 million in bond financing WRPA provided. Having opened restaurants himself, Trevena marveled at the work done to prepare Bistro 1907 for its opening in space that only three weeks ago was just getting drywall. “To see this turn around this fast is absolutely mind-boggling,” he said. Among the contractors doing touch-up work Tuesday was Crowe’s Cabinets, Poland. 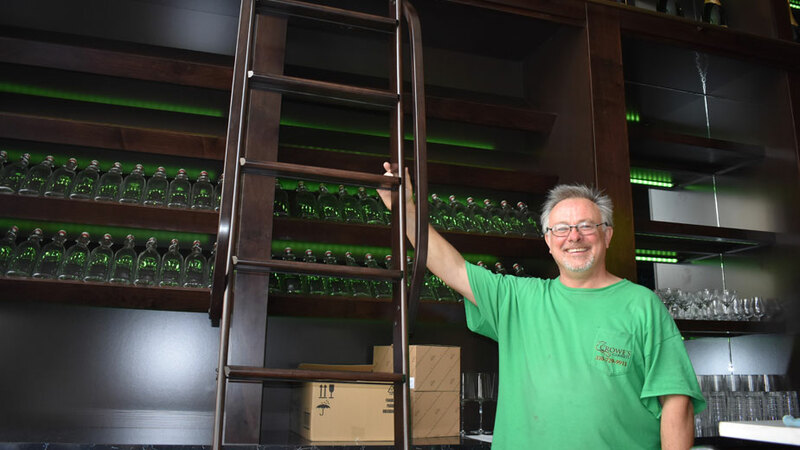 The company installed the cabinetry throughout Bistro 1907 and much of the hotel, said Pat Crowe, a carpenter with the company. “This is completely different than anything I’ve ever done in the Youngstown area,” Crowe said. Pat Crowe of Crowe’s Cabinets points out the high-end cabinetry installed at Bistro 1907. As an artist who spent “a lot of time downtown” in the early 1990s, Crowe said he’s pleased to see downtown’s transformation. “That somebody’s ambitious enough to put this kind of project downtown is really heartening,” he continued. “It’s beautifully done,” he added, pointing out the high-end cabinetry that was used when the developers didn’t need to go to the additional expense. Area businesses are excited to have the opportunity to welcome guests to a hotel in the city’s central business district rather than having them stay in one of its surrounding suburbs, said James Dignan, president and CEO of the Youngstown/Warren Regional Chamber. The hotel will be of particular benefit to organizations near downtown such as Youngstown State University and America Makes. “It’s key that we have all the amenities in our CBD that any other metro has,” Dignan said. The downtown core hasn’t had a full-service hotel since the closing of the Voyager Motor Inn in 1974. The Wick-Pollock Inn, which was across from the YSU campus on Wick Avenue and now is the residence of the university’s president, opened in 1986 and operated for about 12 years. “It’s a great opportunity for us to showcase Youngstown,” Mayor Jamael Tito Brown said. The new hotel gives those visiting the city for shows at Covelli Centre or events at YSU a downtown lodging option, he said. Aside from the “comfort and convenience” for guests of the Youngstown Business Incubator, the hotel’s presence “sends a very powerful, positive message” about the downtown, said the incubator’s CEO, Barb Ewing. “It was certainly awkward or difficult to explain there was not a hotel downtown and they had to stay out in the suburbs,” she remarked. This week, a conference being held at YSU accounts for bookings at the new hotel. More than 300 technology professionals are on campus for the Ohio Higher Education Computing Council Conference. The event, which rotates among institutions, is being held at YSU for the first time in a decade. Although the hotel didn’t play a role in bringing the conference to YSU, the host university is leveraging its presence, said Chris Wentz, YSU information security officer and chairman of the conference’s planning committee. Two years ago, when Cleveland State University was the host institution, the conference was held at a Cleveland hotel and not on the campus. “The proximity of the hotel to YSU helped us leverage the local resources.” So YSU became “the venue of choice” for the conference and helped “to anchor the event here,” Wentz said. Evening activities are taking place at venues that are only a short walk away from the DoubleTree, including Suzie’s Dogs & Drafts. Tens of thousands of individuals visit the YSU campus each year for sporting events and lectures, as well as prospective students and their parents attending Crash Days, said the university’s public information officer, Ron Cole. “To have a facility like this just two blocks away is obviously a great advantage for us,” he said.